Question 1: Mr. President, we are already into the sixth year of the Syrian war. After the recent victories achieved by the Syrian Army in Aleppo and Palmyra, and the ongoing reconciliations, is there a glimmer of hope of an end to the Syrian war? President Assad: Of course, for without hope neither the country, nor the people, nor the state could withstand six years of an extremely ferocious war supported by tens of regional and Western countries, some of the wealthiest and most powerful countries in the world. Without hope, there wouldn’t have been a will. But the question is: how to turn this hope into reality? This has been possible so far through two practical approaches. The first is fighting terrorism, regardless of the different names and categories given to terrorist organizations, and the second is through achieving reconciliations with all those who want to lay down their weapons, return to their normal life, and to the embrace of their country. There has been progress on both fronts: in fighting terrorism and achieving reconciliations. That’s why I say there is more hope now than in the past years. Question 2: In the negotiations conducted previously in Astana and now in Geneva, most negotiators on the other side belonged to the opposition which upholds Wahhabi, Salafi, and Jihadi thought. Why are you negotiating with these people in the first place? And is there in reality a moderate opposition as described by the media? President Assad: This is a very important question, because Western officials, most prominently former US President Obama, said that the moderate opposition was an illusion or a fantasy. This is by their admission, they, who supported that opposition and gave it a false moderate cover. So, this moderate opposition does not exist. The opposition which exists is a Jihadi opposition in the perverted sense of Jihad of course. It is also indoctrinated in the perverted sense that does not accept neither dialogue nor a solution except through terrorism. That is why we cannot, practically, reach any actual result with this part of the opposition. The evidence is that during the Astana negotiations they started their attack on the cities of Damascus and Hama and other parts of Syria, repeating the cycle of terrorism and the killing of innocents. This opposition, between brackets, because it cannot be called opposition, these terrorists cannot be an opposition and cannot help reach a solution. Apart from that, these terrorist groups are themselves linked to the agendas of foreign countries. They do not belong to a certain current or movement among the Syrian people that seeks political reform or a certain solution, neither before nor during the war. Another part of these groups might look political in the sense that they do not carry arms, but they support terrorism. A third part is linked to the Saudi, Turkish, and Western agenda. Question 3: Why are you negotiating with them? President Assad: We do that because, in the beginning, many people did not believe that these groups do not want to lay down their weapons and move towards political action. We went in order to prove to all those who have doubts about this that these groups cannot engage in politics, and that they are terrorist groups at heart and will remain so to the end. Question 4: The world has declared war on terrorism. Do you believe that declaration and in what they are doing today, and can we say that it’s only Syria that is fighting terrorism today? President Assad: The world that declared war consists practically of Western countries which themselves support terrorism. Most countries of the world are against terrorism. They do not declare that, but they have been practically cooperating with us in one way or another during the war, and before the war, because terrorism did not start only with the war on Syria. terrorism has always existed in the world and has become more widespread as a result of the different wars in the Middle East. But the Western countries which declared war on terrorism still support it up till now. They do not fight it. It is used only in name for domestic consumption. The fact of the matter is that they use terrorism as a card to achieve different political agendas, even when this terrorism backfires and claims victims in their own countries. But they do not acknowledge this fact. As to who is fighting terrorism in Syria, it is basically the Syrian Arab Army. This is not only a claim because there are facts on the ground which prove it. The Syrian Arab Army has been able to make these achievements in fighting terrorists thanks, in the first place, to the Syrian fighters’ will, and thanks to popular support. Without popular support, it is not possible to achieve such victories. However, there has been very strong support from our allies, whether it was Iran, Russia, or Hezbollah from Lebanon. Question 5: Does the Syrian Army represent all sects, ethnicities and minorities in Syria? President Assad: Of course, that is self-evident. An army that represents part of the Syrian people cannot win in a war taking place throughout Syria. That is self-evident, regardless of how it is portrayed in the West. At the beginning of the war, the terms used by the terrorists themselves or in the media hostile to Syria in the West and in our region, wanted to portray the war as taking place between sects. This image was widespread in the West. Had this been real, Syria would have been partitioned from the first months of the war. It wouldn’t have withstood for six years as a unified people. It is true that the terrorists control some areas, but the parts controlled by the Syrian state include all parts of the spectrum of the Syrian people. More importantly, they have some of the terrorists’ families and people who fled from terrorist-controlled areas to state-controlled areas. If this Syrian Army, and behind it the Syrian government, do not represent all the Syrian people, it wouldn’t have been possible to see this unified picture of the Syrian people. Question 6: Mr. President, there is a question I have to ask: if there has been security cooperation between the Syrian government and the European states, would have we avoided the terrorist operations which have reached France, Belgium, etc.? I ask this question because after the terrorist operations in Paris, the former head of French intelligence said that you have provided them with names and documents about terrorists, and they refused to accept them. Did they really refuse to accept them? And had there been cooperation, would have we been able to avoid these terrorist operations? 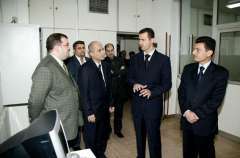 President Assad: No, he was probably speaking about cooperation before the war, because after the beginning of the war and the French position in support of the terrorists, Syria stopped security cooperation with those countries, because there cannot be security cooperation and political hostility at the same time. There should be political agreement, on the one hand, and agreement in other areas, including security, on the other. As to whether it would have been possible to prevent such attacks in Europe through this security cooperation, in normal circumstances, the answer would be yes. But under current circumstances, the answer is no, because Europe, or a number of European countries, support terrorists on a large scale, send to Syria tens of thousands of terrorists, or support them directly and indirectly, logistically, with arms, money, political cover, and everything. When you reach this stage of supporting terrorists – and here we are talking about tens of thousands and maybe hundreds of thousands in Syria and neighboring areas – security cooperation becomes of limited effectiveness in such a case. Security cooperation focuses on tens or hundreds of individuals, but cannot be effective when there are tens of thousands and hundreds of thousands of terrorists. If Europe wants to protect itself at this stage, it should first stop supporting terrorists in Syria. Assuming that we wanted to cooperate with them, no results can be achieved in these circumstances. We will not do that, of course, when they support terrorism. They should stop supporting terrorists immediately in any shape or form. Question 7: Mr. President, I would like to go back to Croatia. In 2009, you visited the Croatian capital Zagreb and met Croatian officials. At that time, I read a statement by Your Excellency in which you said that Croatia is a friendly country and the Croatian people is a brotherly people, etc. Do you still consider the Croatian people a friend of Syria, particularly after the scandal related to arms shipments from Croatia to Washington, and then to Saudi Arabia and Jordan, which ultimately fell in the hands of the terrorists? President Assad: Certainly. The Croatian people is friendly people, and our relations are decades old. We are talking about a relationship which has lasted for generations and is still going on. We do not hold the Croatian people responsible for errors made by their governments. More importantly, if we try to monitor the public opinion in Croatia in relation to what’s going on in Syria, we’ll find that in comparison with other countries, this public opinion has been, throughout the war in general, closer to understanding what is going on in Syria than many other European peoples. Had this relationship and this friendship not been a genuine one, it would have been difficult for the Croatian people to understand what’s going on in Syria. That’s why I would like to stress that what happened concerning the arms shipment that reached the terrorists was one of the ‘achievements’ of the former Croatian government, perhaps for financial interests, or maybe for political interests in the form of giving in to pressure exerted by other big Western powers. But, in any way, they sold the interests and principles of the Croatian people in return for petrodollars, or in the service of the narrow political interests of those officials. Question 8: Is it possible to restore political and diplomatic relations, and probably economic relations, for Croatia has many interests in Syria? President Assad: Of course, this is certainly possible, but this depends on the political orientations of the existing governments. If there have been policy mistakes, particularly those made by previous governments, it is very easy for future governments, or the existing one, to repair these policies. We ask these governments for nothing except thinking first of their peoples’ interests, and second of the international law which is based primarily on the sovereignty of other countries and non-intervention in their internal affairs. We have never, throughout our history and since relations started between us and Croatia now and former Yugoslavia in the past, carried out any hostile act against these countries. We have always considered them friends. What is the justification for a government to send weapons to terrorists in Syria to be used in killing innocent Syrians. I don’t think there is a justification for this; and we hope that the present government does not accept this. Question 9: There is a large number of Jihadis or terrorists who came from the Balkans. Do you have information about their numbers? 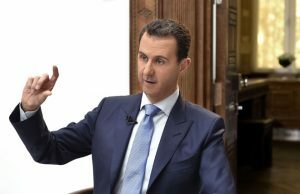 President Assad: There is no accurate information, because of the existence of our Turkish neighbor led by the criminal Erdogan who creates all the circumstances necessary to support and strengthen the presence of those terrorists in Syria. This does not allow us to control the borders, and consequently does not allow for accurate statistics about the number of terrorists who go in and out. But the issue is not about the nationalities of these terrorists, because you know that terrorists look at the whole world as a single arena. They care neither about the national dimension nor about political borders. So, the danger to your country, or to Europe in general, does not come only from European terrorist. It is true that a European can be more dangerous because he knows the region in detail; but he will come accompanied by other terrorists from other countries, terrorists who share the same doctrine, aspirations, and ideas, in order to carry out terrorist acts in those countries. So, when we talk about the number of terrorists in Syria, we are certainly talking about hundreds of thousands, at least more than a hundred thousand. Of course, they come and go, and some of them are killed in battle; but this is our estimate of the numbers. Question 10: Mr. President, average people in Europe or the world ask about the causes of this attack on Syria and the attempts to bring Your Excellency down. And everybody talks about the reform which you have introduced. What’s the reason behind the calls for bringing you down? 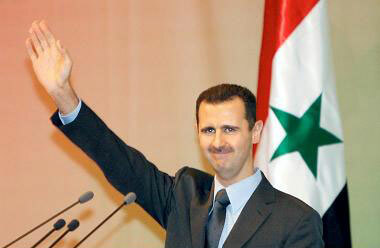 President Assad: The reason is old, simple, and clear. Those Western countries, led by the United States, in partnership mainly with Britain and France, and unfortunately some European countries which did not have a colonial history, do not accept independent states and do not accept peer relations. They want satellite states which implement their policies. Of course, we are not against common interests with other states, with any state. Big states have interests around the world and we, as a state, have interests in our region. We are not a superpower, but when we work, based on interests, with those states, the interests should be joint interests. They want us to act for their interests against ours. That’s why we have always been in a state of struggle with these states over our interests. For instance, we want the peace process, while they want submission instead of peace. They want us to have peace without rights, which is not reasonable. They want us to give up our sovereignty, to abandon our rights which are acknowledged by international law, Security Council resolutions, and the numerous votes at United Nations for the return of our lands. These are mere examples. There are many similar issues over which they consider Syria too independent a state. That’s why they thought that waging war on Syria and replacing the current government with a client government would make it easier and better to achieve their narrow interests. Question 11: Had you accepted peace, or submission as you put it, would what is happening to Syria today had happened? 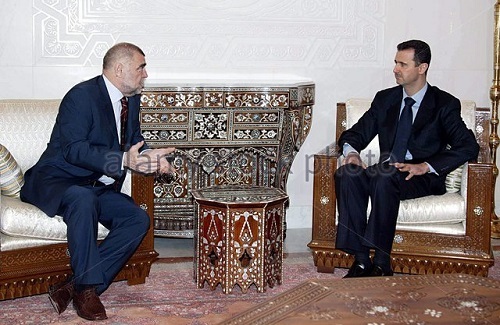 President Assad: In order to talk about something realistic, I would give you an example. We were asked to side with the West, with the United States in particular, in 2003, in its war against Iraq. We knew that the Iraq war was a series of events aiming at partitioning the region, and we knew very well that the conferences which were held before the war in order to define the future of post-war Iraq, all discussed a future sectarian Iraq, and not a unified Iraq. So, we knew that what was happening in Iraq will be carried over to Syria and to the whole region. Had we taken part in such a project at that time, the situation in Syria would have been much worse than if we had refused to do so. That’s why I used to say that the price for rejection or resistance is much less than the price of submission and surrender. I said this many times in the past, and the events in Syria came to prove this argument. What helped Syria to stand fast today is that it is unified. Had we gone along with the sectarian project, following the Iraqi or Lebanese model, as the Americans wanted us to do then, we would have been a country torn by a real civil war. Civil war would have been a reality, not merely a term used to describe what’s going on. Question 12: Why do the Gulf states pay money and support terrorists to bring the government down in Syria? President Assad: Most Gulf states are satellite states which do not dare say no. Some of them say: “We support you but cannot say so publicly. We wish you victory in your war and hope you’ll be able to preserve a united Syria and to defeat terrorists,” but in public they say something different, because they are submissive to the Western will. Most Gulf states, if not all of them, were created by the British at a certain stage and handed over to the Americans at a later stage. That’s why we cannot make a judgment on why they say something or why they say the opposite. Question 13: They talk about creating federalism in Syria. Is that possible? 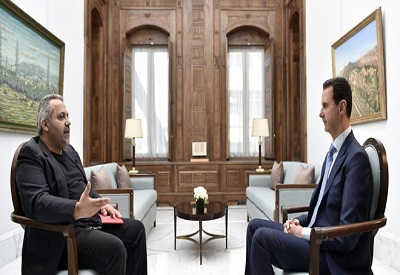 And do you accept the creation of federalism in Syria? Question 14: Turkey sent troops and has a military existence in Syria. Why do you think? President Assad: Because Erdogan had pinned all his hopes on the terrorists achieving victories until the battle of Aleppo happened. For him, it was a decisive battle considering the political, economic, geographical, and logistical importance of Aleppo. The terrorists’ failure to keep their positions in the city of Aleppo as a result of popular rejection on the part of the population of the city and the governorate, and as a result of the achievements made by the Syrian army, caused Erdogan to interfere directly at least to secure a place at the political table when the time comes for talking about the future of Syria. He also wanted to give al-Nusra and Al Qaeda terrorists a facelift after he was exposed worldwide as being very close to them, in every sense of the word. He wanted to give them other names, to make them shave their beards and assume the appearance of moderates, to return things to the way they were at the beginning of the crisis, and as I said to secure a role for Turkey in finding a solution in Syria through the terrorists in their new form. Question 15: There is the same issue with American troops which are in the country and help the Kurds now. Do you consider them occupation forces? President Assad: Of course. Any intervention, even the existence of any individual soldier, without the permission of the Syrian government, is an invasion in every sense of the word. And any intervention, from the air or otherwise, is also an illegitimate intervention and an aggression on Syria. Question 16: Why is America here? What are the reasons in your opinion, Mr. President? President Assad: In general terms, the American policy is based on creating chaos in different parts of the world and creating conflicts among states. This is not new. It has been going on for decades, but in different forms. Through these conflicts, it secures a foothold through the contradictions and through its proxies who are already there but were able to become prominent because of the new circumstances. And then it takes part in bargaining in order to secure its interests in that region. This is an old American policy. Question 17: How do you see the election of Trump as President of the United States? And can you cooperate with him, particularly after recent statements on the part of the new American administration which said that the Syrian people determine the fate of the President. Do you think there is a change in the American policy? President Assad: First, concerning the different statements about whether the President should remain or leave, and since the first statement made during the Obama administration, which has been repeated by the political parrots in Europe, we have never paid any attention to it and never commented on it because it does not concern us. This is a Syrian issue related to the Syrian people. That’s why all that has been said on the subject is simply thrown in the rubbish bin. So, any similar statement, with or against, made now by any state, is not acceptable now, because this is not an American or a European issue, nor is it the concern of any other individual outside Syria. 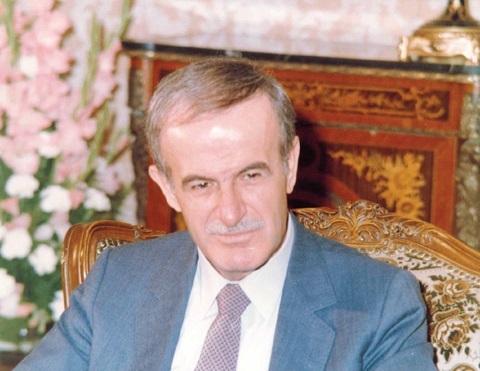 As to our evaluation of the new American administration, and despite the fact that it is still in its early days, we have learned something important since relations were resumed between Syria and the United States in 1974, when former American President Richard Nixon visited us. We learned not to bet on a good administration. We always say which is a bad administration and which is worse. We do not say which is good and which is better or which is bad and which is good. What we see in America now are endless conflicts: conflicts inside the administration and conflicts outside the administration with the administration. That’s why we see only one thing in this administration, regardless of the statements which seem to be better than those of other administrations. Since they sent troops to Syria without coordination and without a request from the legitimate Syrian government, it means that this administration, like other administrations, does not want stability to be restored in Syria. Question 18: Mr. President, Syria has been subject recently to continuing Israeli aggression. What is the objective behind that? And are you concerned about the possibility of a Syrian-Israeli war? President Assad: Concern about a war is unrealistic, because the reality is that we are living this war. But as for calling it a Syrian-Israeli war, you can assume in any case that these terrorists are fighting for Israel. Even if they are not a regular Israeli army, they are still fighting for Israel. And Israel shares the objectives with Turkey, the United States, France, Britain, Saudi Arabia, Qatar, and other states. They all share the same objective. It is a war that has taken a new form and uses new instruments. Practically, our victory over the terrorists is a victory over all those states put together. That’s why Israel is doing its best to support these terrorists in every place the Syrian Army advances. They attack in one way or another in order to provide support to the terrorists and in order to stall the momentum of the Syrian Arab Army in facing them. 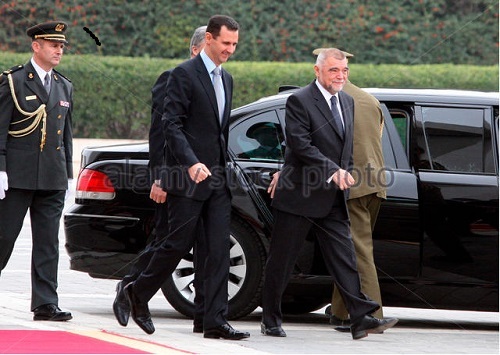 Question 19: Recently, many European parliamentarians started to flock on Syria, some publicly and some secretly. Does this mean that something has happened or does this imply a change in the European policy towards Syria? Have they understood that you were right? 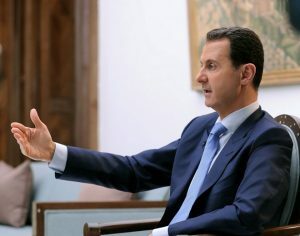 President Assad: The European policy has not actually changed, because the European officials have gone too far with their lies; and now if they want to make a U-turn, the European public opinion will tell them: you were lying to us. All of what you said was not true. That’s why they have persisted in their lies but with a few modifications from time to time. They have reproduced the same product using different packaging in order to deceive their customers, i.e. the European public opinion. The Western public opinion has changed, first because those lies cannot go on for six years while belied by the facts. Second, thanks to the social media, it has become difficult for the corporate media linked to the political machines in the West to control the ins and outs of information and data throughout the world. Third, this happened as a result of the huge migration waves towards Europe and the terrorist acts which hit a number of European states, particularly France. These different events have made the Western citizen ask questions about the reality of what’s going on. What has changed in Europe today is that the public opinion knows very well that the corporate media and the politicians are lying. But the public opinion does not know the full truth, it knows only part of the truth and is seeking out the truth of what is happening in Syria, what happened in Libya, and what’s happening in Yemen today, and is asking questions about the relationship between the officials in their countries and the petrodollars in the Gulf states, and other questions. Question 20: You said recently that 2017 will see the end of the war in Syria. Do you still believe that the war in Syria will end this year? President Assad: No, I did not say this literally. I said several times that without Western intervention, we can end this war and all its ramifications in a few months, i.e. in less than a year. That was in 2016, and was interpreted that the war was at an end and that the next year will see the end of the war. Of course, things are moving in a better direction, as I said, not in the interest of the terrorists but in the interest of the Syrian people, but war is unpredictable, especially that the countries which have supported the terrorists are doing their absolute best to protect them, first because the defeat of the terrorists means a political defeat for them in their countries, and second because exhausting Syria is one of the major tasks they have been trying to accomplish through the terrorists and through war. 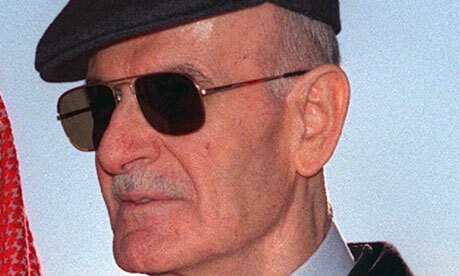 So, even if Syria was able to come out of this war, they want the bottom line price to be Syria’s exhaustion and fatigue so that Syria will have energy only to feed and rebuild itself and forget all the other issues surrounding it in terms of its rights and duties in relation to the different countries in our region. In other words, they want Syria to be unable to play any active, valuable, or weighty role in the region. Journalist: Are you confident of the victory of the Syrian-Russian-Iranian alliance? 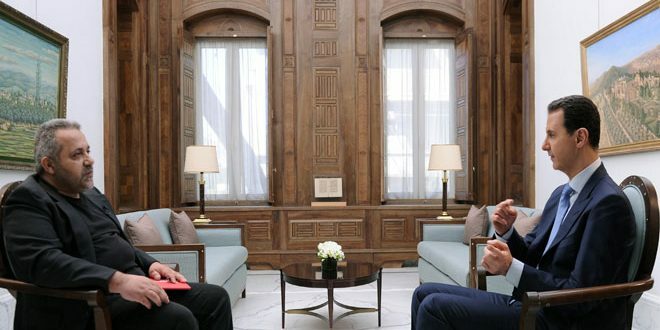 President Assad: As I said a while ago, we have a great hope which is becoming greater; and this hope is built on confidence, for without confidence there wouldn’t be any hope. In any case, we do not have any other option except victory. If we do not win this war, it means that Syria will be deleted from the map. We have no choice in facing this war, and that’s why we are confident, we are persistent and we are determined.